1782 – The Spanish captured Minorca from the British. Must have been pretty popular as there was a shortage of pennies after it was introduced. Not real keen on the green outfit. But then again I don’t know fashion. 1869 – The world’s largest recorded gold nugget is found in Victoria, Australia. And Syd chased balls Again and Again and Again etc.. I hope you all had a Fabulous day to remember as well. Yeah, but that’s a pretty little white girl. Poor child – her parents should have at least insisted on her face being pixilated. On another matter, I’ve been having fun over the past few weeks sussing out the provenance of various things in my parents’ collection of things (fortunately a small collection – they were minimalists, despite my complaints). I took it along to show to me mum at lunch today. At first, she had no idea what it was (neither did I). After about five minutes, however, she said she thought it was something she’d used when doing pottery. Me mum had two stints at pottery (as far as I know): during the 1950s, at Canberra Tech, when she was lucky enough to have one of the amazing Boyd artists as her teacher, and in 1972 in Kuala Lumpur. I don’t know the name of her teacher there, but she created something quite lovely, which I will try to reproduce here soon. Anyway, the particular implement is old, definitely older than the early 1970s. It was made in Japan, though the maker’s name is almost impossible to read. The wire at one end is an elongated capital “D”; the wire at the other end is a very elongated trapezium. If anyone can tell me what this implement was/is used for in pottery, I would be very pleased! A couple of hours ago DD and her partner became the proud slaves of two grey and white desexed microchipped 3-year-old cats (rehomed). 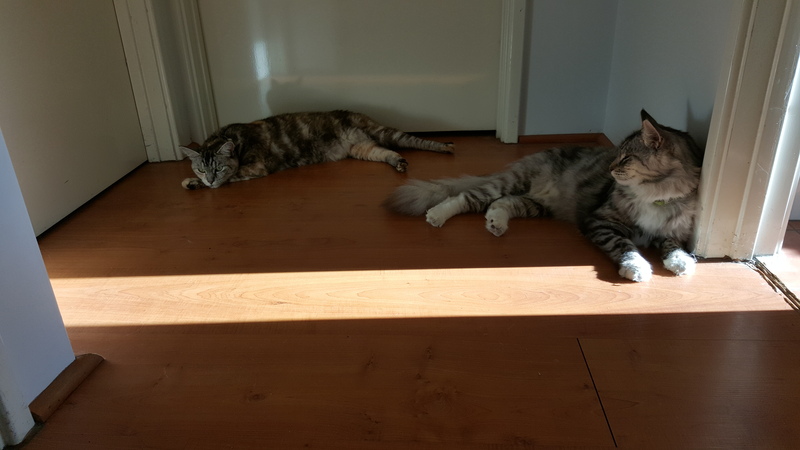 Indi is the shorthair with only the stump of her tail; Jax is the magnificent, lordly male. The cats are siblings, and are used to being house felines, so I wish DD and partner all the best. It’s a double-end wire end tool, it is used for sculpting and modelling clay. You don’t use it when you are shaping your pot on the wheel though – or so I was told. I used to sell pottery-making gear and clay in a previous life. Never got actually do any pottery-making myself though. Thank you! I knew the encyclopedia that is The Pub would come to my rescue. As far as I know, I have only four things made by me mum – a charming very modern 50s sugar bowl, a stark but lovely fruit bowl (again, 1950s), and two amazing abstract bird shapes (1973). There’s also a plate somewhere by her Boyd teacher. I must find out who it was. Jay Weatherill has written to Turnbull offering to take the 267 asylum seekers and supporting Daniel Andrews. Paul Sheehan says Turnbull would be certifiably insane if he went ahead with the 15% GST. The four things that make Rubio sound like a broken record. Turnbull puts the acid on the states to raise their own revenue. 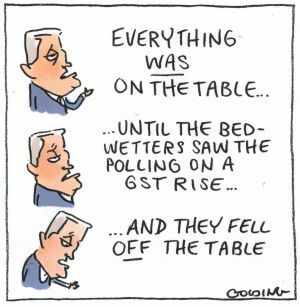 Matt Golding plots the trajectory of the GST debate within the Coalition. Peter Martin tells us that the abandonment of the white paper process has given us a tax debate without a debate. And Ross Gittins wants a more in-depth review of spending in health and education rather that the superficial stuff we are used to hearing about. The SMH asks if Turnbull is just another politician when it comes to the republic. Ross Fitzgerald on why alcohol causes so much damage that is hard to fix. The dark side of energy drinks.